Sports are in full swing once again, and many children are participating. Which leads to one common question among coaches, parents, and your dentist. 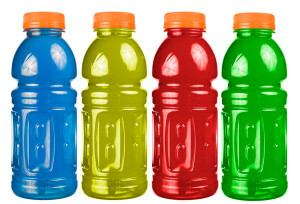 Should I, or should I not, send my kids to practice with a sports drink? The American Dental Association, American Academy of Pediatric Dentistry and, the American Academy of Pediatrics are all in agreement when they recommend that you don’t give your children sports drinks as a means to keep them hydrated. Water is still the best and most effective method to ward off dehydration while playing sports. Here’s why: Sports drinks were created mainly for adult athletes who were practicing for hours on end in extremely hot weather conditions. The formula created for said sports drinks was intended to keep the athlete hydrated while replenishing electrolytes that were lost due to extreme sweating. Most children who are playing sports are not playing in extremely hot weather conditions for countless hours each day. Therefore, the purpose of sports drinks is invalid. A study published by the journal General Dentistry found that sports drinks, also known as energy drinks, contain excessive amounts of acid that will start destroying teeth after only five days of regular consumption. The damage to tooth enamel can cause teeth to become sensitive to touch and temperature, and also opens them up to cavities and tooth decay. In another recently published article, Sarbin Ranjitkar, BDS, PhD, states, “Our research has shown that permanent damage to the tooth enamel will occur within the first 30 seconds of high acidity coming into contact with the teeth. This is an important finding and it suggests that such drinks are best avoided.” You can read the full report here. Water is still the best way to keep your child hydrated according to the AAPD, ADA. and the AAP by sticking with water you avoid unwanted tooth decay and other dental problems. No one really wants to spend unnecessary time at the dentist office, right? Copyright © 2017 Pediatric Dental Assistant School. All Rights Reserved.